1. When during the planting season should a producer switch to an earlier maturing soybean variety? In southern Wisconsin, full season soybean varieties (>1.8RM) out yielded earlier maturing varieties (<1.8RM) by 15 bu per acre at early May planting dates compared to only 2 to 5 bu per acre at late May planting dates. In northern Wisconsin, late maturing varieties (1.7 to 1.9RM) also out yielded early maturing varieties (<1.7RM), however the difference was not as great. Switching to an earlier maturing variety when planting after the first week of June will reduce the chance of damage from an early fall frost (Fig. 1.). Unfortunately growers will realize a yield penalty if they choose to move to an earlier maturity groups and lowered seeding rates (Table 1.). It is also important to note that if you do choose to switch to an earlier maturity group soybean, do not use a variety that is more than 0.5 RM earlier than you normally would plant. 2. When is the latest soybeans can be planted in Wisconsin and still expect a grain yield? Research from the 1990’s in southern Wisconsin indicates that in two out of three years, grain can be harvested from soybeans planted as late as June 26, although the yields are usually minimal and not generally economically feasible. The frequency of harvesting grain from soybeans planted this late can be increased by using early maturing varieties (<1.8RM) in southern Wisconsin, and <1.0RM in northern production areas. A planting date of June 20 in southern Wisconsin and June 15 in northern Wisconsin, using early maturing varieties, was considered to be the latest practical date. However today’s grain prices coupled with opportunities for late-season discounted treated soybean seed may entice growers to push the planting date window in 2011. Figure 1. 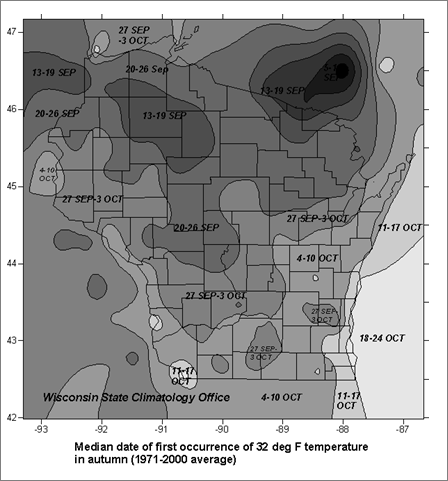 Median frost date for WI. * Figures in bold italics are for shorter season maturities.